Las Vegas NV, November 1, 2005 – At SEMA 2005, Roush Performance Products (RPP) introduces the 4.6 liter, 3-valve Mustang ROUSHcharger for 2005-2006 Mustang GTs. RPP engineers have developed a Roots-type ROUSHcharger and companion aluminum intake manifold that generates approximately 5 psi of boost. The package includes a large, free-flowing air-to-water intercooler used to cool and condense the ROUSHcharger’s intake air for added performance. Additional features of the system include a larger fresh air inlet, low-restriction air filter, large diameter clean air tube, a single-belt drive system for the ROUSHcharger and all engine accessories, intercooler heat exchanger and pump, and a unique Roush supercharged calibration. When equipped with high-flow fuel injectors and lower-heat-range spark plugs are also included in the fully integrated package, the ROUSHcharger produces 430 horsepower at 6300 rpm and 385 foot-pounds of torque at 4500 rpm on the 4.6-liter 3-valve GT V-8 engine. As with all Roush Performance Products (RPP) powertrain offerings, the ROUSHcharger is backed by an industry-leading 3-year or 36,000 mile warranty that includes coverage on all ROUSHcharger components, as well as the vehicle’s drivetrain components, including: engine, transmission and rear axle. The ROUSHcharger was designed for easy installation. Roush Performance Products (RPP) is the street performance division of Roush Enterprises, parent of Roush Racing and Roush Industries. 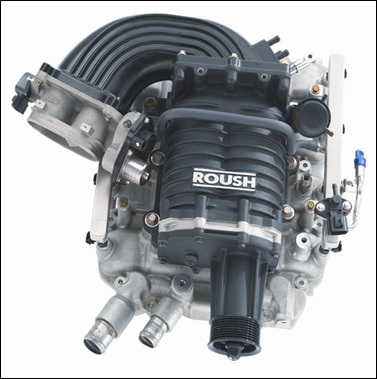 For more information on Roush vehicles, parts, and performance crate engines, or to find a list of Roush distributors, please visit www.roushperformance.com or store.roushperformance.com.